Isabel Metcalf encloses a postcard of Bear Cove Camp in New Hampshire as well as a letter. She is glad that the health regiment Martha Berry is on is helping her. 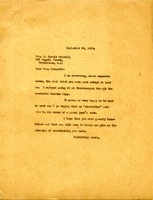 In the letter, she lets Martha Berry know she received the book and that she does not think she will be visiting Berry anytime soon, but that is not certain. Martha Berry returns a book Metcalf lent to her and lets her know that she enjoyed it and used it at Oberammergau during the Passion Play. Berry informs Metcalf she is on a "starvation cure". Mr. Grady Hamrick sends Martha Berry a postcard from Germany. Mr. Grady Hamrick sends Martha Berry a postcard from Germany featuring Johannes Lang Hans in the Passion Play.